With more than 10 years’ experience in general dermatology, Dr Rakesh Patalay also has particular expertise in procedural dermatology (skin surgery, lasers and non-surgical cosmetic treatments). He trained in Mohs micrographic surgery at Guy’s and St Thomas’ from 2013-14. He also has expertise in skin cancer, lesion and mole assessment and treatment. 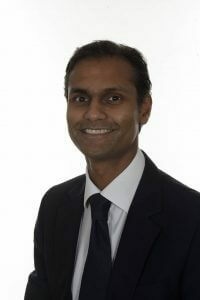 Rakesh is a key opinion leader in the UK for skin imaging and is active academically in this field. He led the NICE review and co-authored the Cochrane Review for the use of reflectance confocal microscopy (RCM) in skin cancer. He has published in numerous scientific and clinical journals, contributed to book chapters and has been an invited speaker internationally. Skin imaging including reflectance confocal microscopy, optical coherence tomography, and multiphoton microscopy. 1999: MBBS, University College London. In 2013, Rakesh was awarded a PhD from Imperial College London, and the following year qualified with a CCT in Dermatology and a Mohs Surgical & Laser Fellowship, London.